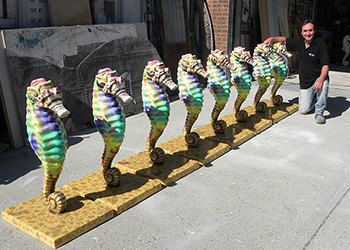 Giant sea horses created for Ipswich art trail, 2018. 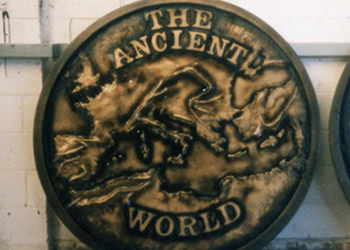 Carved from polystyrene, moulded in silicone rubber, and cast in glass fibre and artworked with internal metalwork. 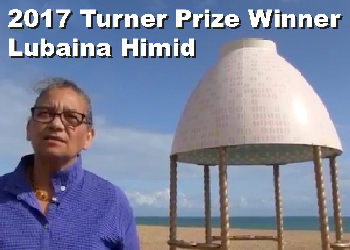 Sculpture Studios are proud to offer their personal congratulations to Lubaina Himid for her success in winning the 2017 Turner Prize. 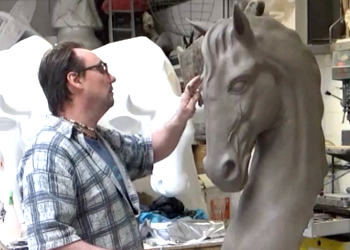 Life size horse head carving, modeled from clay. 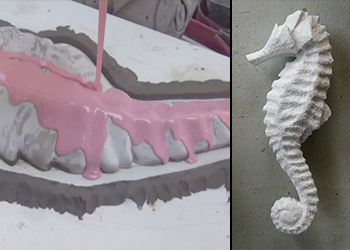 Mould created from silicone rubber and with a fibreglass jacket, and x3 casts made from glass fibre. 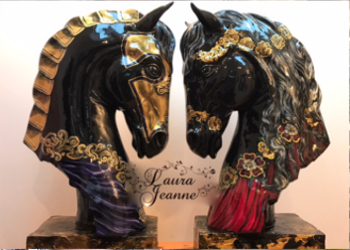 Commissioned and artworked by artist Laura Jeanne. 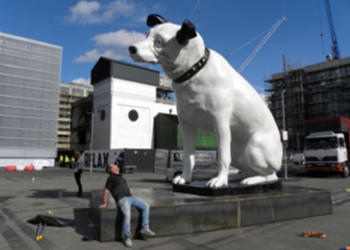 Giant 5m tall Nipper the HMV dog, created to go outside the old vinyl factory in Hayes. 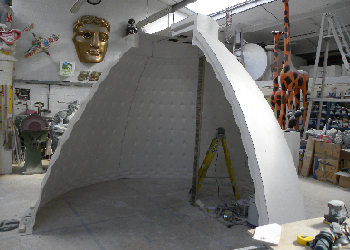 3D cut from polystyrene / styrofoam, covered with a blanket coat of glass fibre with a resin flow coat finish and painted. 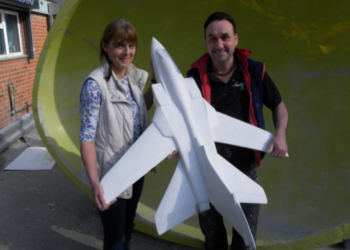 Small scale fibreglass Tornado fighter jets, created for Kings Lynn's 2016 art trail: the 100th anniversary of RAF Marham. Commissioned by Pauline Petch and the 75th Squadron Air Cadet Training Corps, to raise money for charity. 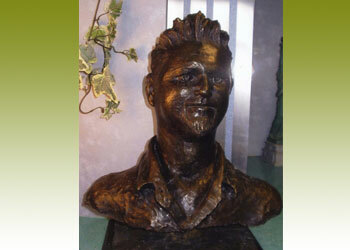 Carved from polystyrene / styrofoam, moulded in silicone rubber and fiberglass and cast in glass fiber. 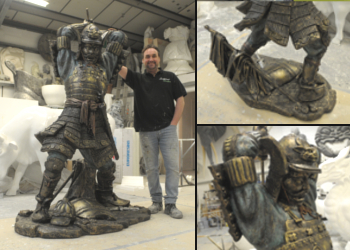 Lifesize statue of a Samurai Warrior at 2 metres tall. 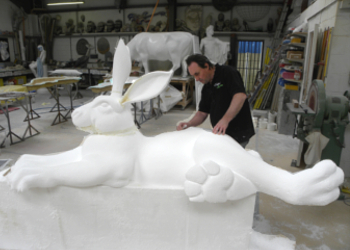 Carved from polystyrene / styrofoam, with a blanket coat of glass fibre. 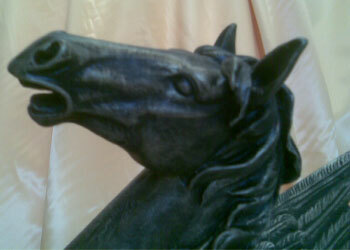 Details created from resin and fast cast plastic. Finished with a dry brush bronze paint effect. 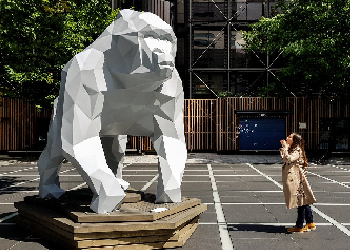 Gus, the 3m giant silver back gorilla, created for WILD LIFE exhibition in London, as part of the London Design Festival. Commissioned by Broadgate and designed by Marokka, in collaboration with the Aspinall Foundation charity. 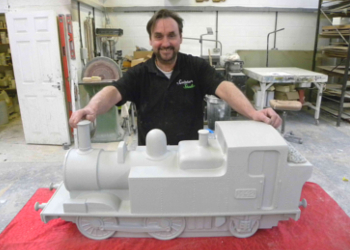 3D 5 axis cut from polystyrene / syrofoam, mould and cast glass fibre with a 2k paint finish. 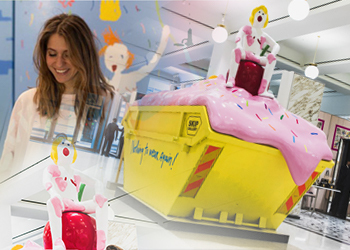 "Nothing To Wear Today", a piece of Skip Art designed by artist skip art Maja Djordjevic, for an art installation in Selfridges, London. Carved from polystyrene / styrofoam, with a blanket coat of glass fibre, flow coat of resin, worked up to a good gloss finish, and artworked. 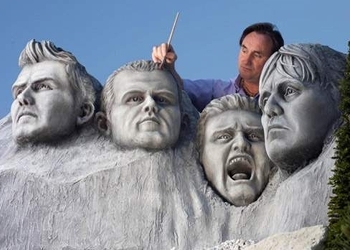 Iconic Mount Rushmore depicting famous footballers, carved in polystyrene / styrofoam. Created for Lotto as a garden sculpture. Special feature of Paul Gascoigne crying. 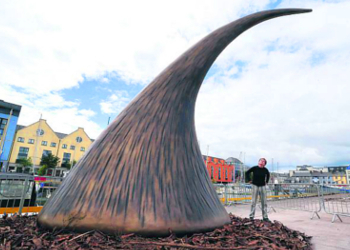 Giant 6m Thorn, carved from polystyrene, and finished in glass fibre with a bronze look effect. Commisioned and created for Irish artist Patrick O'Reilly, as part of his exhibition at the Galway Arts Festive, alongside his 'Shed' exhibit. Giant classical style statue, carved from polystyrene / styrofoam with a soft water based plaster render finish and white emulsion paint. 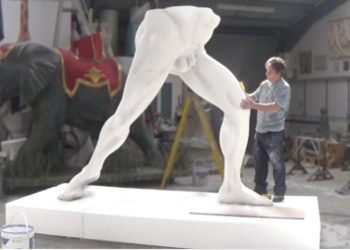 Greek / roman olympian posed legs, created for Burberry's Makers House in Soho, London. 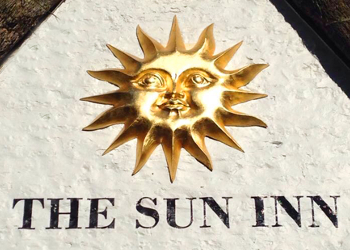 3 fibreglass suns created for the Sun Inn Pub exterior wall and sign, in Cottesmore, Oakham. 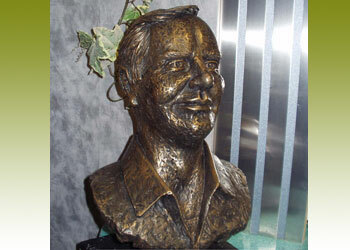 Carve from polystyrene / styrofoam, moulded from glass fiber, and all cast from fibreglass. Gold paint and gold leaf finish. 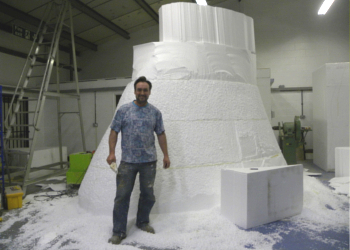 A resin artwork, around 15ft tall, carved from polystyrene / styrofoam. Sculpture placed in the entrance for the Children’s Physician Building and Children’s Hospital at the Oklahoma University Medical Center. Commissioned by artist Mackenzie Thorpe. 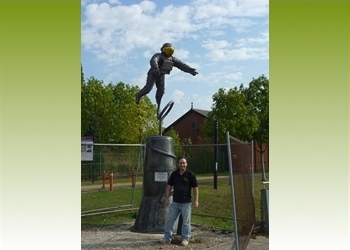 Spaceman public sculpture for entrance of National Space Centre in Leicester, made from fibreglass. 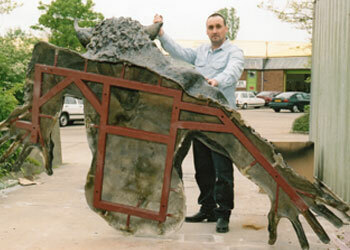 Piece of sculpture made for the Radclyffe School in Manchester. 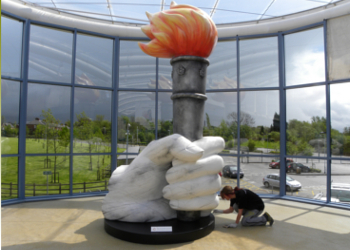 Designed by eight students at the school, carved in polystyrene / styrofoam, with a blanket coat of glass fibre, to resemble a giant hand and olympic style flame and torch. 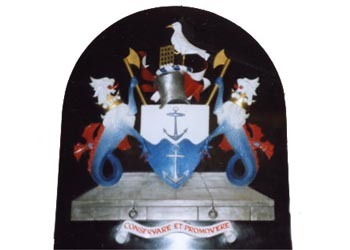 To be exhibitioned at the front of the school, overlooking the main entrance. 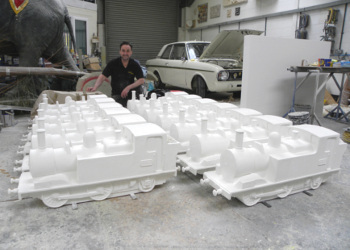 21 miniature Tivvy Bumper steam engines created for the Tiverton Museum's "All Aboard!" 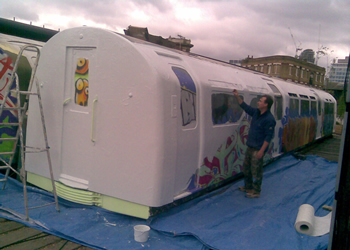 art train. 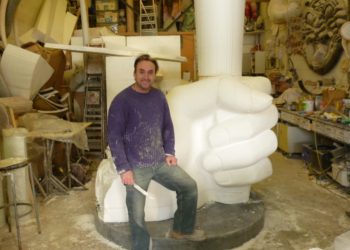 Modelled, moulded and cast in glass fibre, primed white to be artworked by schools, companies, sponsors and artists in and around the town of Tiverton in Devon. 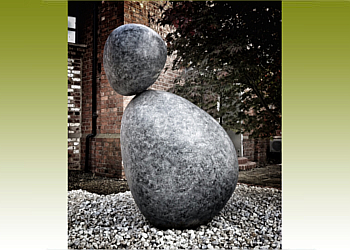 Two stones, carved from polystyrene / styrofoam and coated in glass fibre with internal metalwork. Made for Wendy Freestone's company building, as an adaptation of the company logo. 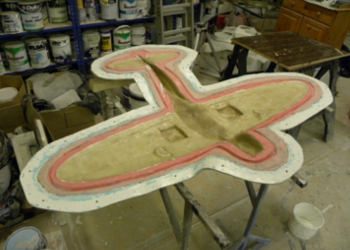 Fibreglass Spitfires, created from glass fibre. 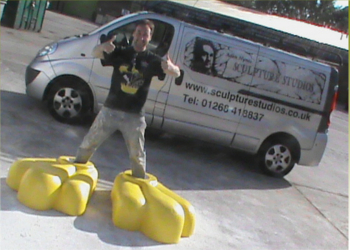 Silicone mould taken from an existing model, with a fibreglass jacket. 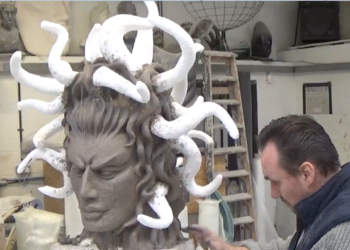 2 ounces of fibreglass matt and a white gel coat layer, to create a white primed finish for art working. 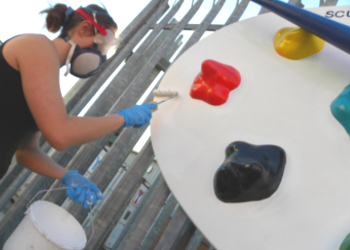 This batch was created to King's Lynn Arts trail, commissioned by Flight Lieutenant Pauline Petch, of the 42 Founder King's Lynn Air Training Corps. 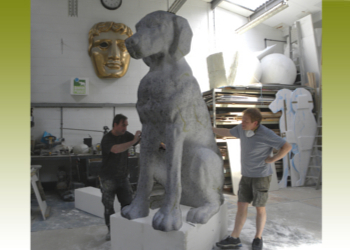 Giant concrete dog and plinth created for Evian Christ's trance event at the ICA in London. 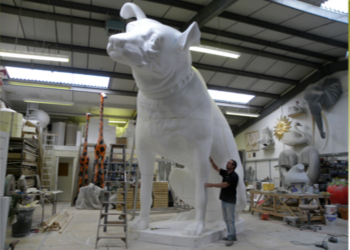 Carved from polystyrene in the style of a German Pointer, and covered in a render of flexible concrete for a one day event. Commissioned by David Rudnick. 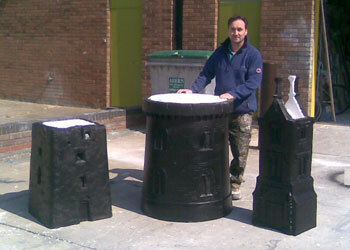 A collection of public art props built for a promotion of the Disney Pixar film Wreck-It Ralph. An 8bit taxi, post box, tree, dog, security camera, several pigeons, clouds and many more items were produced and then placed on location in London's Brick Lane. 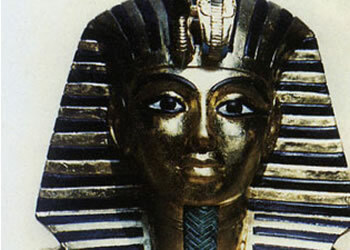 Originally carved in polystyrene / styrofoam, then coated in a protective plastic, painted and varnished for protection. 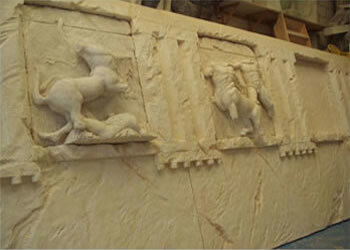 Religious frieze, carved in polystyrene / styrofoam and finished in bronze resin, for a temple in Leicestershire. 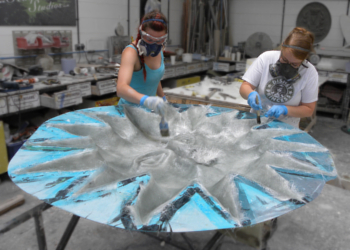 This is the first central section of larger piece. 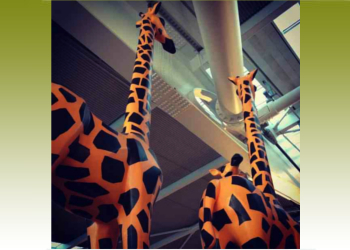 3.5m tall fibreglass giraffes, made for the Giraffe Restaurant Group. Commissioned piece of work by artist Tony Stallard. Replica air-fix type kit on surrounding frame. 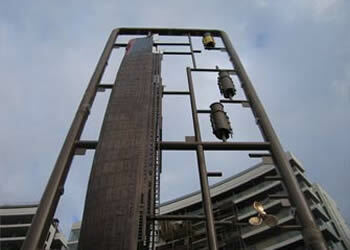 Made from bronze, standing at approximately 9.5 metres tall and placed in Belfast dock yard. 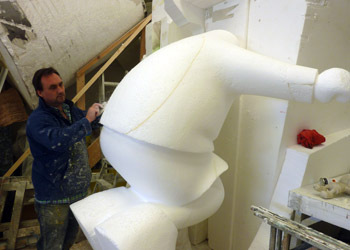 Built in Sculpture Studios using a polystyrene carving as a plug to cast from. 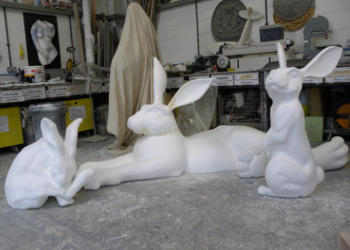 Giant rabbits created from polystyrene / styrofoam, hand carved for the 2017 Mayfair Flower Show. Collaborations of rabbits and hare images, blown up to large scale. 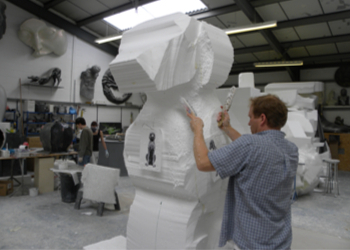 Eight full scale polystyrene / styrofoam carving elephants, in glass fibre from a production mould and painted to look lifelike. 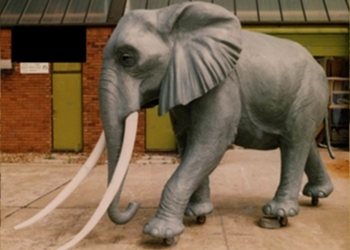 For exhibitions, displays, movie props and TV, these elephants are readily available - production time three weeks. Email for details. Two sets of holly leaves and berries mounted onto a snowy base. All carved from polystyrene / styrofoam and produced in fibreglass and designed to sit atop traditional red phone boxes as Christmas decorations. 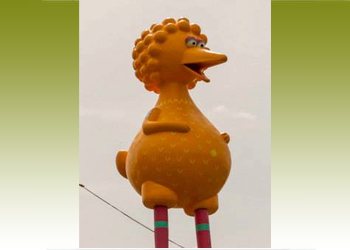 Giant yellow bird made for The Secret Garden Party. 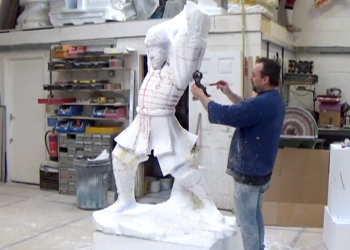 Carved in polystyrene / styrofoam and finished in fibreglass, standing 3.5m tall from head to bottom of body. 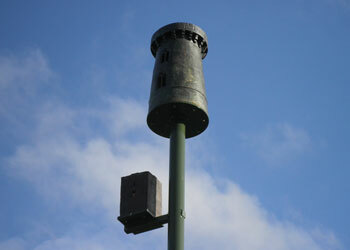 Allowed for custard tube to be sprayed from rear of bird for interactive public sculpture. 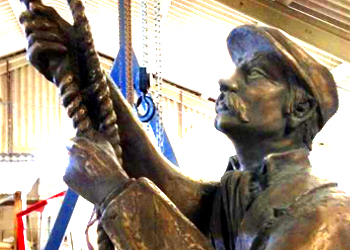 "The Docker" figure carved from polystyrene / styrofoam, moulded and cast in bronze, to commemorate the Port of Newry. 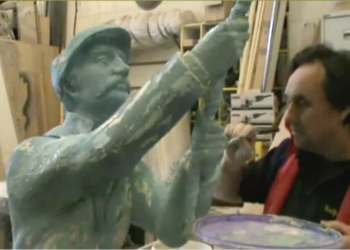 Sculpture commissioned by Tony Stallard. 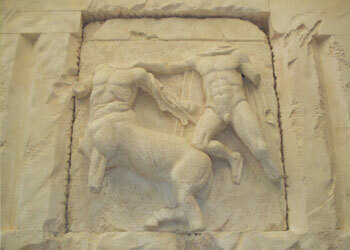 Run of wall depicting the Elgin marbles, created as a polystyrene carving with a flexible concrete render. Made for a BBC TV documentary. A purple tree, created for the 2012 Olympics. Assembled as four piece at Heathrow Airport for the ceremonies. 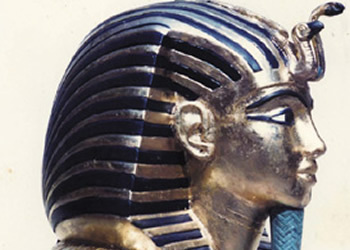 Carved from polystyrene / styrofoam, and finished with metalwork and fibreglass. 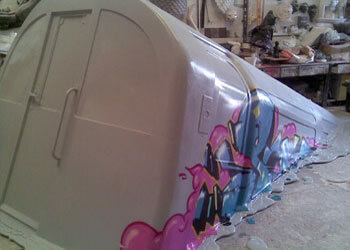 Heart shaped sculpture made for the artist INSA for an exhibition in London. 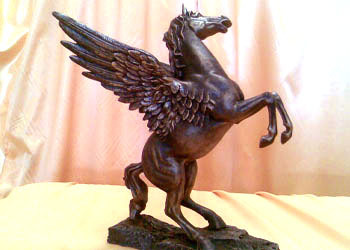 Carved from polystyrene / styrofoam, finished in glass fibre with a black/chrome finish. Designed to resemble a woman's booty when up the other way. 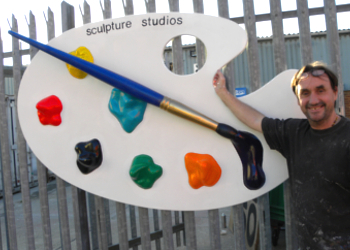 Giant Paintbrush and Pallet, cast in fibreglass, for the front of the new Sculpture Studios workshop. mould was 20 odd years old, but the cast came out perfectly. 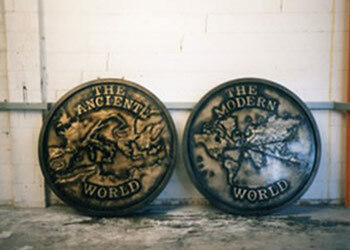 Mould taken from an Underground train, reproduced in fibreglass and painted to look as if it had come out of the ground and wall in the exhibition space. Had graffiti applied to represent street art. 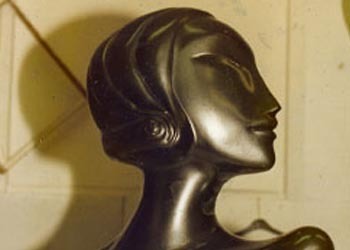 An art deco lady figure modelled from clay and with a production mould taken. 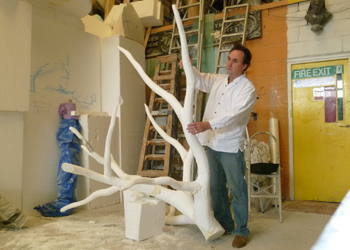 30 casts were made in glass fibre for a jewellery and necklace display. 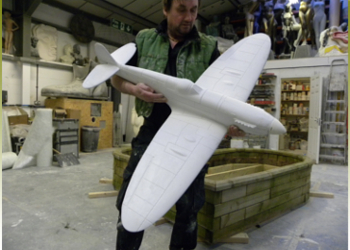 Modelled in clay then produced in glass fibre from a plaster mould. Finished in gold leaf. 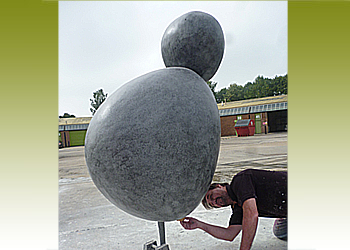 Life-size head and shoulders for an exhibition. 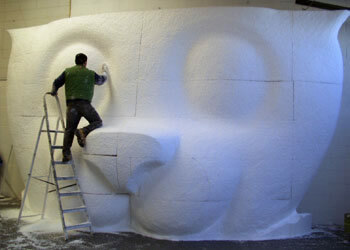 Carving of a 7m teddy bear head, made from polystyrene / styrofoam. Entire surface rendered with 12mm of concrete. Placed on Gloucester Road underground station platform. 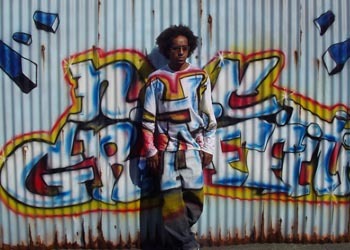 Graffiti corrugated wall, air brushed along with clothing for Ford’s commercial. 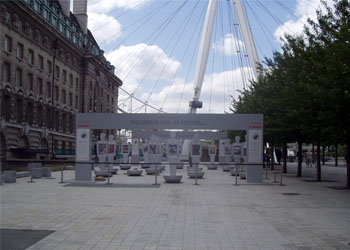 Twenty-two large Subbuteo type figures positioned on London’s south bank beside the London Eye. 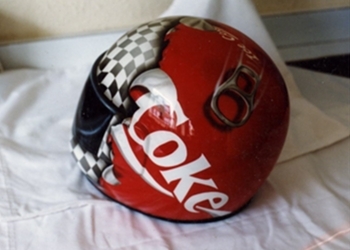 A set of crash helmets created for display and sales branding. 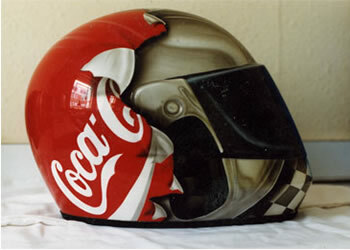 Airbrush work to a high standard of finish. 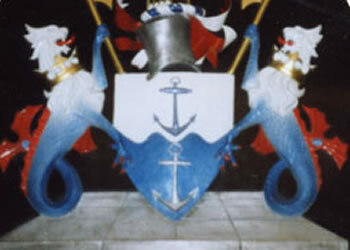 Coat of arms made for company wall above reception desk. Made from glass fibre and art worked. 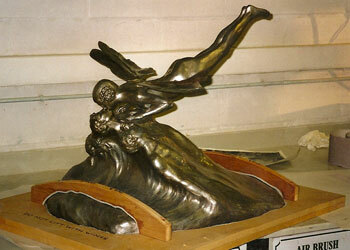 Sculpture carved to be cast in bronze, approximately 22 inches/650mm. 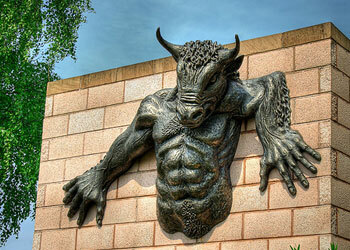 Minotaur sculpture created in bronze resin, commissioned for Manchester town centre to be bursting from a wall. 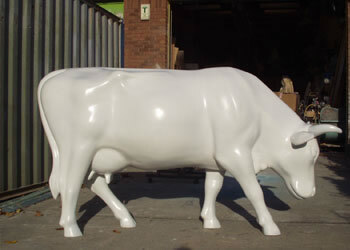 Full-size glass fibre cow. 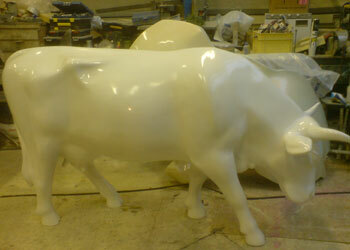 These cows are readily available with a three week build, and can be art worked to any design. 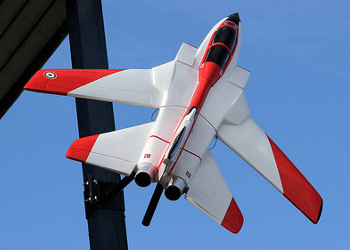 Made for the Aeronautical Flying competition, and was made from cold cast aluminium resin with a teak wooden base. Alginate moulds taken from a company director's face. 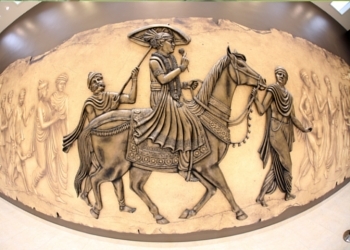 Made from high-density plaster of paris, waxed and lackered. Alginate moulds taken from a company director's face. 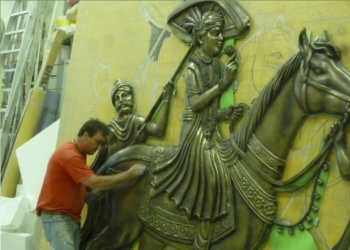 Made from high-density plaster of paris, waxed and lacquered. 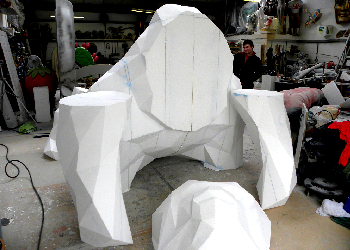 Master patterns made as polystyrene carvings and plaster coated, to be cast in bronze at a foundry. 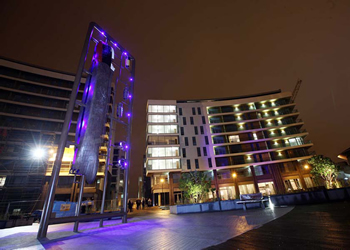 The final three pieces were made for artist Tony Stallard and were on public display for the Brownlow Linear Stream Urban Sculpture trail, Northern Ireland. 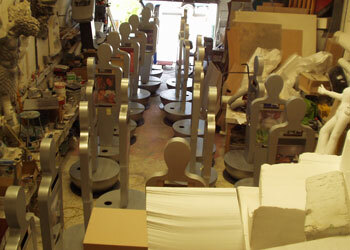 Sculpture Studios is preparing many original pieces of art for well established artists world wide.